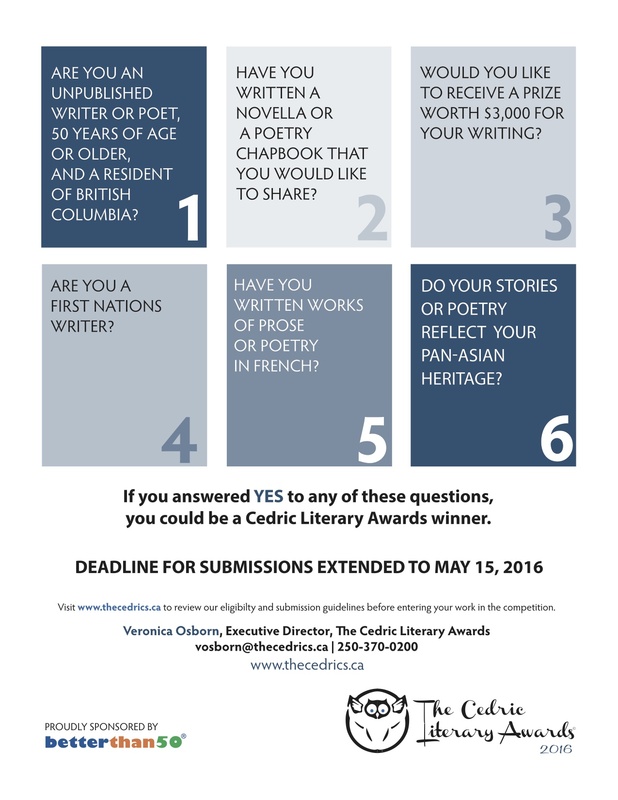 Calling all BC writers over the age of 50! Great opportunities to turn your family history into a piece for submission to the Cedric Literary Awards and win $3,000! Important notice: Due to overwhelming demand from a number of different writing communities, the deadline for receipt of submissions for the 2016 Cedric Literary Awards has been extended to midnight on May 15th, 2016. Please go to www.thecedrics.ca and click on “submissions” to read the complete competition guidelines and submission instructions, or email <vosborn@thecedrics.ca> for more information. Tags: Arts and Culture, Cedric Literary Awards, Family History, literary. Bookmark the permalink. Previous post ← Welcome Amador Astudillo!